OC Inc. Posts in category: "ParkerLecture"
Tears mixed with memories, moments of levity and inspiration as three media justice advocates were honored today by the United Church of Christ’s Office of Communication, Inc. at the 36th Annual Everett C. Parker Telecommunications Lecture and Awards Breakfast in Washington, D.C.
Helen Brunner, a longtime philanthropist and founding director of the Media Democracy Fund, delivered this year’s lecture. 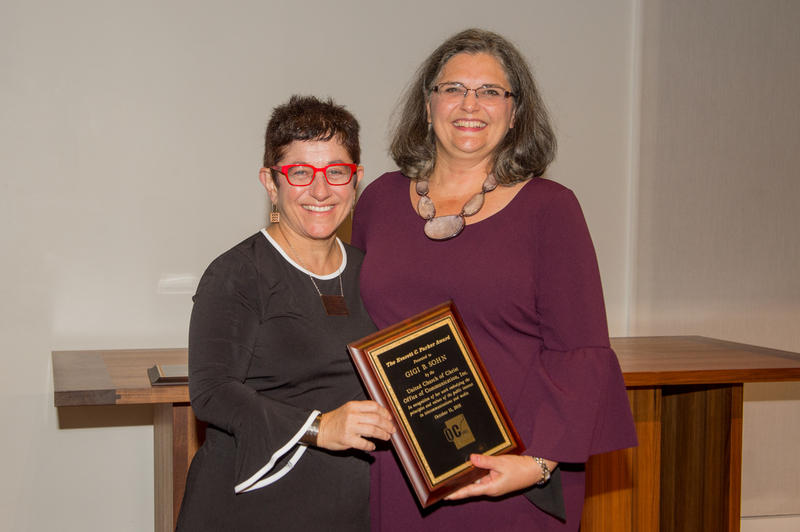 Gigi Sohn, a Distinguished Fellow at Georgetown Law Institute for Technology Law & Policy and a Benton Foundation Fellow, received the Everett C. Parker Award in recognition of 30 years of work in support of greater public access to affordable and open broadband technologies. And Kevin Sampson, founder and director of the D.C. Black Film Festival, received the Donald H. McGannon Award in recognition of special contributions to advancing the role of women and persons of color in the media. OC Inc., the UCC’s media justice ministry, created the Parker Lecture in 1983 to recognize its founder’s pioneering work as an advocate for the public’s rights in broadcasting. In 1963, Rev. Parker filed a petition with the Federal Communications Commission that ultimately stripped WLBT-TV in Jackson, Mississippi, of its broadcast license for its failure to cover the local African-American community. The court case also established the principle that the public could participate in matters before the agency. 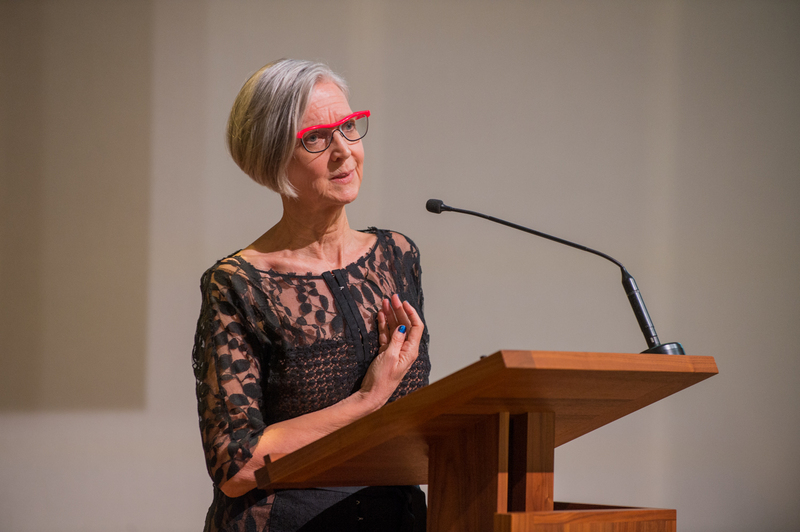 Brunner devoted much of her address to the audience of advocates, policy makers and faith leaders to the importance of addressing mental health concerns and practicing self-care—particularly as it relates to social justice advocates. She acknowledged that she had “almost died from my own self-inflicted pressures,” but that in the two years since she had stepped down from directing the Media Democracy Fund, she had taken steps to address her own mental health and learn more about the nature of Post-Traumatic Stress Disorder. “The ground has shifted,” she said, “and many things that used to work, don’t any longer.” She encouraged her audience to fight burnout and to recognize that social justice work would “go better if you protect your mental, physical, and spiritual health. Your work will be more effective and creative if it comes from expansive rather than constrictive thoughts, if it comes from love rather than fear and overwhelm.” She emphasized that “the future is going to happen and we have a choice: we can work for the future we want, or we can let it happen. 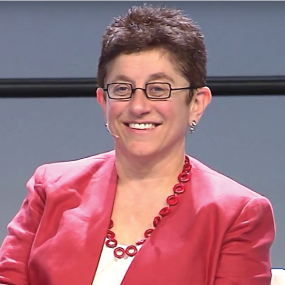 Know that you will have results.” Brunner drove home her message by coaching her audience in a round of meditative breathing, and providing a break of laughter by encouraging them to bat beach balls around the sanctuary of First Congregational United Church of Christ in downtown Washington. About the United Church of Christ: The United Church of Christ is a mainline Protestant denomination comprised of nearly 900,000 members and 5,000 congregations nationwide. 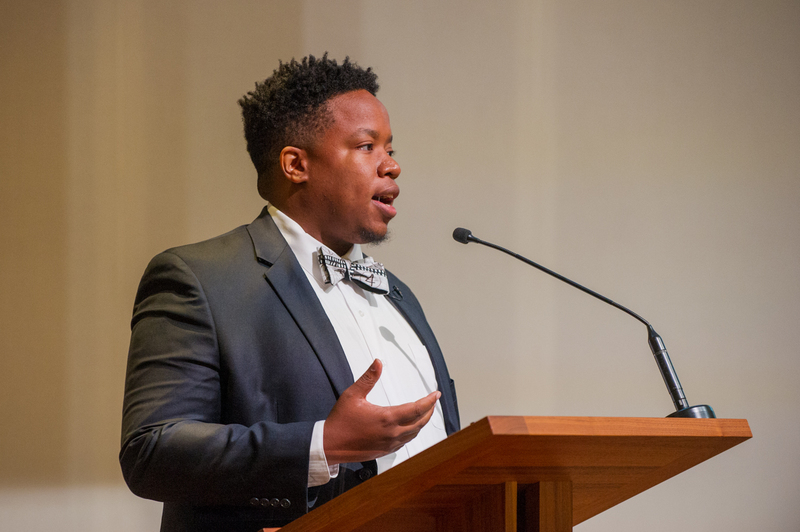 Headquartered in Cleveland, Ohio, the UCC is a church of many firsts, including the first mainline denomination to ordain a woman, the first to ordain an openly-gay man and the first predominantly white denomination to ordain an African American. The UCC and its members are tireless advocates for social issues such as immigration reform, racial equality, LGBT rights, marriage equality, environmental protection and economic justice. The Parker Lecture is the only lecture in the country to examine telecommunications in the digital age from an ethical perspective. More information is available at http://uccmediajustice.org/content_item/parker2018. The United Church of Christ’s media justice ministry will honor Kevin Sampson, founder and director of the D.C. Black Film Festival, when it holds the 36th Annual Everett C. Parker Ethics in Telecommunications Lecture and Awards Breakfast on October 11. 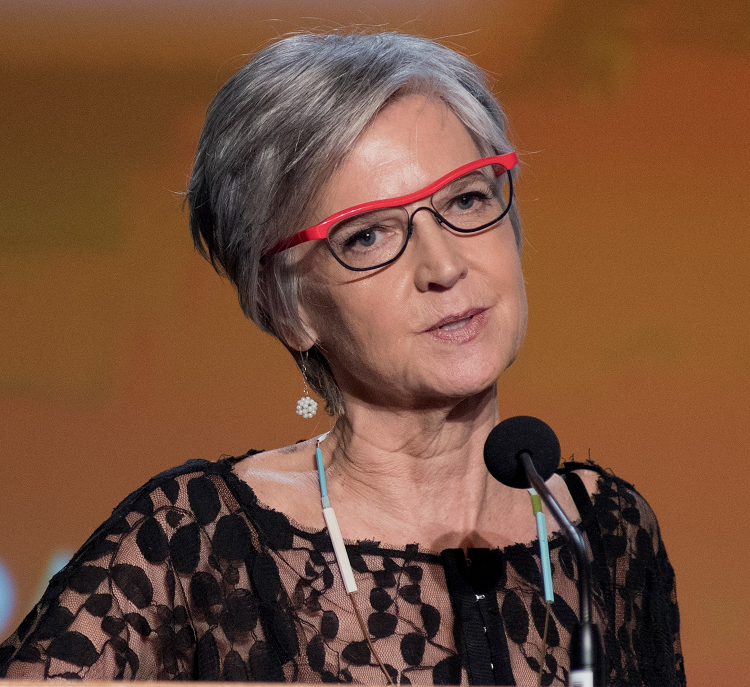 As previously announced, Helen Brunner, founding director of the Media Democracy Fund, will deliver this year’s lecture, and Gigi B. Sohn, a Distinguished Fellow at the Georgetown Law Institute for Technology Law & Policy, will receive the Everett C. Parker Award. The event will be held at First Congregational United Church of Christ, 945 G Street NW, in Washington, DC, beginning at 8 a.m.
Sampson will be honored with the Donald H. McGannon Award, which OC. Inc. confers in recognition of special contributions to advancing the role of women and persons of color in the media. 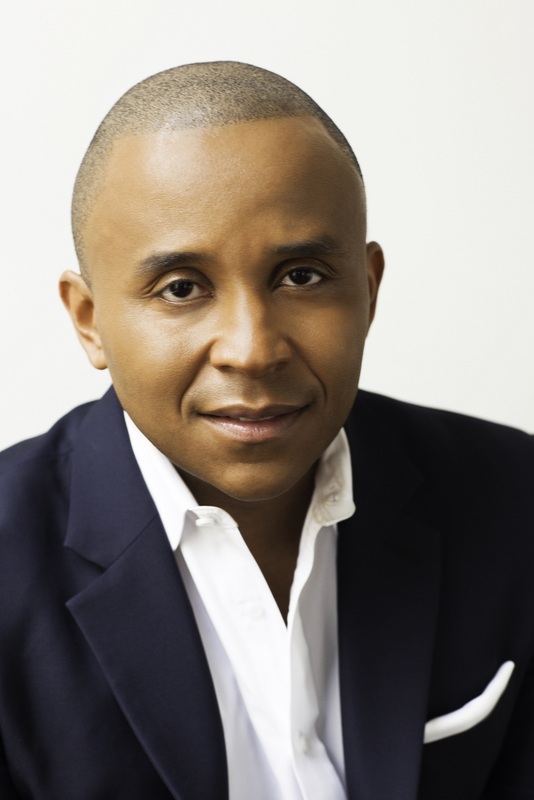 As a film critic, writer, producer and director, Sampson has used his talents to promote the work of African-Americans and independent film makers through a wide variety of media. In 2012, Sampson took his love of film to a new level by creating Picture Lock, a D.C. area entertainment website, TV show and radio show/podcast, which he continues to produce and host. The following year, he became director of the Rosebud Film Festival, dedicated to highlighting the best of independent films. In 2016, he created the D.C. Black Film Festival to promote positive images of African-Americans and exhibit quality video productions by and about people of African descent. He then launched Picture Lock PR to represent and promote some of the independent films and under-promoted stories he sees in his roles as film critic and festival director. 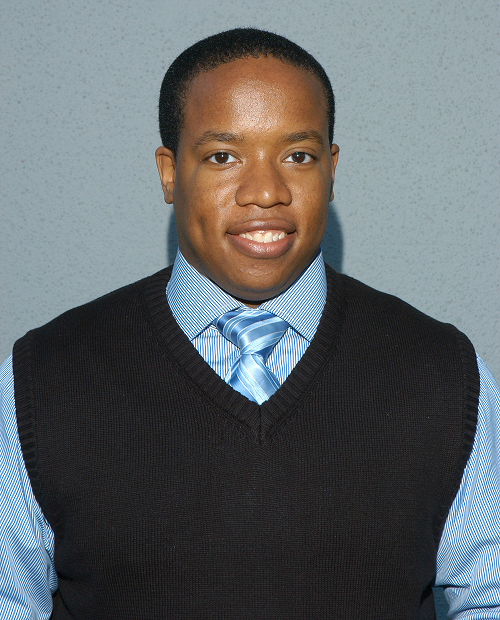 Sampson is a member of the Washington, DC area, North Carolina and African American Film Critic Associations. He holds a master’s of fine arts in film and electronic media from American University and a bachelor’s in media arts from the University of South Carolina. The Parker Lecture was created in 1982 to recognize the Rev. Dr. Parker’s pioneering work as an advocate for the public's rights in broadcasting. The event is the only lecture in the country to examine telecommunications in the digital age from an ethical perspective. Rev. Dr. Parker died in 2015 at the age of 102. The Cleveland-based United Church of Christ, a Protestant denomination with nearly 900,000 members and 5,000 local congregations nationwide, recognizes the unique power of the media to shape public understanding and thus society as a whole. For this reason, the UCC’s OC, Inc. has worked since its founding in 1959 to create just and equitable media structures that give a meaningful voice to diverse peoples, cultures and ideas. For more information about the 2018 Parker Lecture and Breakfast, or to purchase tickets, go to www.uccmediajustice.org. Rashad Robinson, executive director of the Color Of Change, and Ravi Kapur, founder and CEO of Diya TV, will be honored at the 35th Annual Everett C. Parker Ethics in Telecommunications Lecture and Awards Breakfast, the United Church of Christ’s media justice ministry, the Office of Communication, Inc., has announced. This year’s event will be held at 8 a.m. October 24 at First Congregational United Church of Christ, 945 G Street NW, in Washington, DC. OC Inc. previously announced that Rinku Sen, outgoing president and executive director of Race Forward: The Center for Racial Justice Innovation, will deliver this year’s Parker lecture. Robinson will receive the Everett C. Parker Award in recognition of his efforts to build Color Of Change into the nation’s largest online racial justice organization, with more than one million members. The Parker Award is given annually in recognition of an individual whose work embodies the principles and values of the public interest in telecommunications and the media as demonstrated by the late Rev. Dr. Parker, OC Inc.’s founder. Under Robinson’s leadership, Color Of Change has championed media justice, developing strategies for changing written and unwritten rules that negatively impact the lives of Black people, people of color and all people. A frequent commentator in broadcast and print outlets, Robinson previously served as senior director of media programs at GLAAD and worked on racial justice and voting rights issues at the Right to Vote Campaign and FairVote. Kapur will receive the Donald H. McGannon Award, given in recognition of special contributions in advancing the role of women and persons of color in the media. Kapur’s Diya TV is the first 24-hour U.S. broadcast network targeted to serve a South Asian audience, reaching more than 70 million people in a dozen markets. Kapur became the first Indian-American to own a full-power TV station in this country. His first broadcasting venture, KAXT-TV in San Francisco, developed programming to serve the Bay Area’s African-American, Hispanic, South Asian, Vietnamese, Chinese, Taiwanese, Korean and Filipino communities, and Kapur led the station to its first Emmy Award in 2013. The Parker Lecture was created in 1982 to recognize the late Rev. Dr. Parker’s pioneering work as an advocate for the public's rights in broadcasting. The event is the only lecture in the country to examine telecommunications in the digital age from an ethical perspective. A list of previous Parker Lecture honorees is available on our web site.